The Philly artist will release her debut album fantasii on Halcyon Veil in July. Earlier this year, I was lucky enough to catch Lavendra, a show by Philadelphia visual artist E. Jane. The solo exhibition turned a Brooklyn gallery space into an immersive, purple-tinted sanctuary in which to honor black women. On the walls hung lovingly crafted collages of R&B stars, including Aaliyah and Whitney Houston, while the floors were dotted with screens showing videos of the artist in fantastical digital environments. It felt like stepping inside a music video mood-board, and in a way it was, for E. Jane's alter-ego is Mhysa, and electronic artist and one-half of SCRAAATCH. 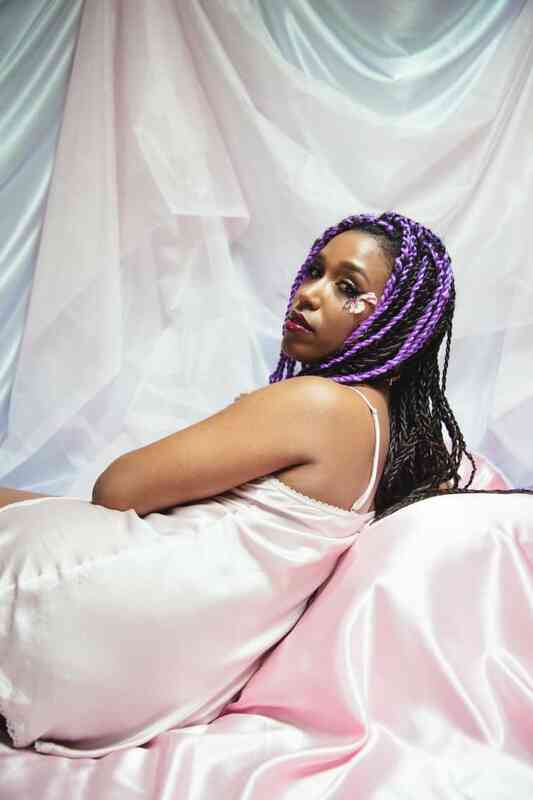 This July 21, Mhysa will release her debut album fantasii on Rabit's label Halcyon Veil, and today you can hear a brand new track from it called "Bb." 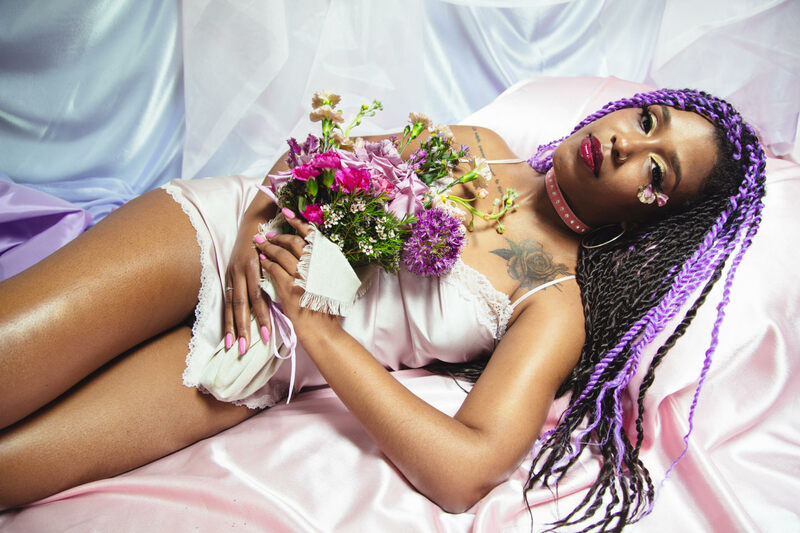 Produced by lawd knows, Mhysa's partner in SCRAAATCH, "Bb" is an aural rendering of Lavendra, all swathes of silken synths and tactile percussion. The spacious sonics center sensual vocals: "Touch me/ And kiss me/ Love me/ Still love me," she sings over drums that don't so much beat, but lounge. A whisper over six minutes long, it's less of a ballad and more like a meditation on the healing power of R&B. 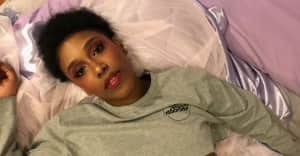 "With 'Bb,' I wanted to make a full-on RnB song," Mhysa told The FADER over email. "I wrote the lyrics and did the arrangement and lawd knows produced the beat. Being a Black American woman from the American south, I wanted to draw on my roots and my history and engage the genre that feeds me so much. This is the only RnB song on the album and it's special to me because it allowed me to be vulnerable in a way I'm usually not in my music." "I'm used to being vulnerable about my feelings on Black death but not my feelings about wanting to be desired, longing — things that I and many other Black women and femmes still think about and need," she continued. "I'm not letting go of my rage, but I also need joy, desire — really to experience the full range of emotions because I am human and those feelings are inside of me, as they are inside of all of us. We are still living even as we mourn, and some of us don't have the time to even mourn because capitalism keeps us so burdened with alienated labor." Listen below, and check out some beautiful images from photographer Naima Green's fantasii album cover shoot. Halcyon Veil will release Mhysa's album fantasii on July 21.